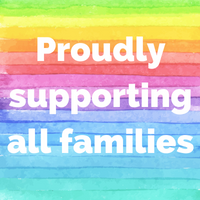 LGBTQ+ families need to know who in the Nashville birth community welcomes all families in their practice. We are working towards a day where identifiers like this aren't needed, but for now, these families need our support in a visible way. Here are two versions of the LGBTQ+ support website badges for birth workers. To add a badge to your website, simply right click on the image (CTRL+ click for Macs), and then save to your computer. You can then paste the image onto your website to let families know that you are open for business to all!